Recently, two more Windows 10 Creators Update internal build 15011 and build 15012 information leaked online. Windows 10 insider build 15012 for PC and build 10.0.15012.1000 for mobile devices is now under testing. 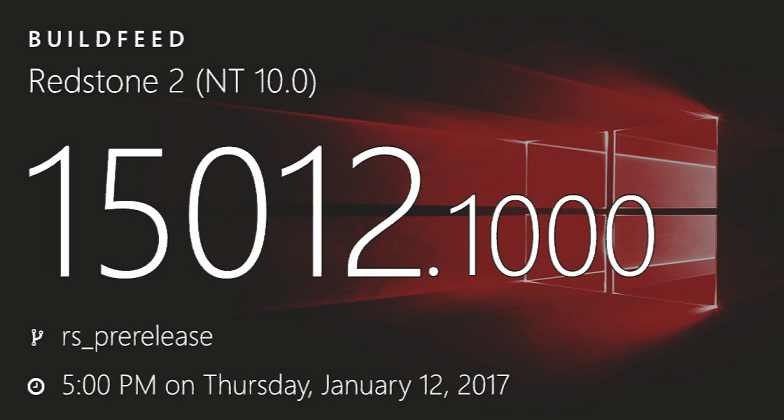 The new Insider build 15012.1000 is compiled on January 12. Also, Insider team recently tested insider build 15011 for PC and mobile build 10.0.15011.1000. The build 15011 was compiled on January 11. Meanwhile, Windows 10 insider build 15007 for PC and mobile is now available for fast ring members. The latest insider build comes with many new features. However, now few Insider members are reporting ‘download stuck at 0%’ and other issues with the build. Read here and here for fixes for build 15007. Additionally, the company also released a new cumulative update KB3213986 build 14393693 for PC and mobile build 10.0.14393.693 for Windows 10 Anniversary Update users and cumulative update KB3210721 build 10586.753 for Threshold 2 users.